In this Social Media Examiner podcast with a provocative title, Michael Stelzner, Mitch Joel and Mark Schaefer discuss the potential death of blogging. You probably heard that before and while consumer blogging is probably dead (Yahoo buying Tumblr didn’t save the category), let’s have a look at whether this bold prediction stands for SMB content marketers. Where should you host your content? Content is a continuum: from shared content to micro-content, status updates or social visual content to blogs, articles and eboks or slideshare, there’s a multitude of content formats. Content platforms and social networks offer better and better editing capabilities and they come with a massive argument: the promise of an audience through your social connexions. Let’s take Medium or LinkedIn blog platforms: it’s tempting to dump your old WordPress to publish on these and leverage not only the fancy and simple editors but also the existing community and the potential reach through your existing network and connexions. But just because some third-party platforms offer great editing or hosting capabilities, does it mean you should host your content there? Do they offer an audience or the promise of an audience? 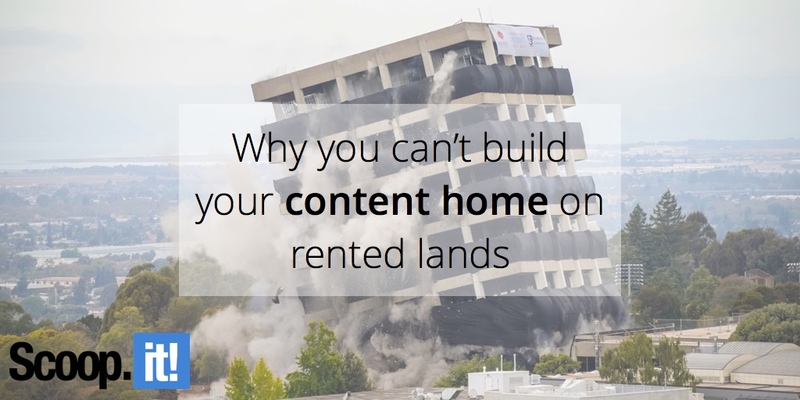 SMB marketers: can you really afford to build your content home on rented land? How much of your traffic comes from social vs search and direct traffic? Rented land will not help your site’s SEO so unless you’re getting 70% of your traffic from a strong network, you’ll miss out big time. Can you afford not to convert? Content platforms or blogs don’t let you add CTA’s and conversion hooks to subscribe top of the funnel visitors to subscribe to your email newsletters or bottom of the funnel prospects to talk to sales. Can you live off brand awareness only? Can you pay to play? Content platform mostly live off selling content placement either in native streams or search results, hence the decline of organic reach over time. More and more of their users join the publishing party, but attention doesn’t grow as fast: when I first published on LinkedIn as part of the early access program, my posts were doing thousands of views; I’m now happy when I generate 1,000. LinkedIn’s answer? Do you have deep enough pockets to compete? Leveraging existing platforms’ audiences is a good strategy: it helps bootstrap an audience and even at cruising altitude, it helps boost visibility for your ideas and thought leadership. As we’ve shared in this case study, our own findings were that republishing to Medium, LinkedIn and industry blogs helped boost our views and shares by 65%-80%. But content marketing is not about pageviews and shares: it’s about attracting prospects through content that answers the questions they have throughout their buyer’s journey in order to convert them as leads and progressively nurture them as customers. On other people’s properties, your content will miss out the compounding SEO traffic and fail to convert your potential clients. So unless you’re an established influencer with a strong network and even if you can tactically leverage third-party audiences, a blog is probably the most accessible content marketing format to generate ROI from your SMB’s content marketing investments. And if you’d like to know more about how a content hub is your secret to a long and prosperous life in publishing, help yourself to this great freebie by downloading the eBook here. 4 Comments on "3 Reasons why you can’t build your content home on rented land"
It’s amazing to me how many people use Facebook as their content home, when it scrolls off the timeline so fast, and Facebook even removes links on pages that are posted. Thanks for reminding people about the importance of owning their own blog.